When tragedy struck a Newtown, Connecticut community five and a half years ago, an unimaginable nightmare unfolded while the country looked on in horror. Heavily armed, 20-year-old Adam Lanza shot his way through a plate glass window adjacent to the entrance of Sandy Hook Elementary School, stoically proceeded down a hallway, and systematically took the lives – one by one – of 20 first graders and six school personnel with a Bushmaster Model XM15-E2S rifle. But even before victims were laid to rest after their fatal shootings, former U.S Department of Education Secretary Arne Duncan and Chicago’s Mayor Rahm Emanuel exchanged messages on how to frame the tragedy, politically. During a roughly 10 minute period, the native Chicagoans exchanged seven messages two days following the massacre, in which Mayor Emanuel, who had previously served as President Barrack Obama’s chief of staff, advised Secretary Duncan on what position he should take on the Sandy Hook shootings. Two days after the Sandy Hook massacre, the former education secretary and the sitting mayor of Chicago were already discussing a national strategy. The Brady Bill and Assault Weapons. In the early nineties, Mayor Emanuel worked under President Bill Clinton on the Brady Crime Bill. Named after President Ronald Reagan’s press secretary, James Brady, who had been shot by a man attempting to assassinate the Republican president, the Brady Bill forced a five-day hold on all firearms pending a background check and prevented certain individuals from ever obtaining a firearm. Within a year of the passage of the Brady Crime Bill, President Clinton also signed into law a Federal Assault Weapons Ban. The bill had first passed in congress, while narrowly passing in the U.S. Senate. The 10-year ban, which began in 1994, prohibited the manufacture of certain semi-automatic firearms which were classified as assault weapons. The ban also outlawed large capacity ammunition that were capable of holding more than the standard number of rounds. But the ban expired in 2004, and attempts to have it reinstated as federal law have been unsuccessful. ReThink Discipline. Who’s to blame? Arne Duncan, who served as President Barrack Obama’s Education Secretary from 2009 to 2015, began working on instituting new school discipline policies in 2011, ultimately disseminating federal guidance for schools in 2014. The goal was to remove schools’ zero-tolerance behavior policies and to reduce and eventually eliminate disproportionate suspension and expulsion gaps between white students and students of color. Coined “Rethink Discipline,” the move was an effort to curb suspensions and expulsions as a means to eliminate what 2014 civil rights data show are disproportionate rates of out of school consequences between white students, students of color, as well as students with learning disabilities. The data shows that black students make up 16% of the student population, yet make up 32-43% of suspensions, while their white counterparts make up 31-40% of the suspensions and expulsions, yet are 51% of the student population. The Civil Rights research also shows that depending on which national statistic is being referenced, black children, specifically, were suspended at least three to four times more than white students at the time the 2014 study was conducted. The idea behind the discipline guidance was to end a cycle seen as racially unfair and to keep students – all students – in school as a way to help end segregation as well as prevent the loss of classroom instruction. The federal data showed that when students are not in school – especially disproportionately by race – they are missing valuable instructional time unequally; and by losing valuable instructional time, students are less likely to graduate from high school or go on to pursue higher education. The interruption in the educational process was seen to continue the cycle of school-to-prison-to-continued-poverty, especially for minority students. But the way Duncan aimed to solve the disparity was through a federal initiative that measured the success of the program by a deliberate reduction in suspension and expulsion numbers, for numbers’ sake. In other words, as a means to end suspension and expulsion disparities, every year the suspensions and expulsion numbers would be required to demonstrate a downward trend which means school administrators would need to suspend and expel students fewer times with each subsequent year. Additionally, school-based officers would be coached in avoiding the arrests of students and would receive awards for improvement in arrest numbers. The result: chaos and violence erupting in schools across the country. But despite criticism Duncan has received for the discipline policy changes he instituted while education secretary, he sees his primary failure at the White House, as he worked in the capacity of education secretary, as being unable to help successfully pass improved gun laws. Meanwhile, two mass shootings at schools have occurred over just the last three months alone. A third shooting involved a Southern Maryland school in which a 17 year-old boy wounded a 14 year-old boy, while killing a 16 year-old female student. In February, 19-year-old Nickolas Cruz, a former student of Marjory Stoneman High School in Parkland, Florida, opened fire with an AR-15-style rifle he purchased one year before. Cruz killed 17 students and teachers in his rampage, while injuring 14 others. One of those wounded students, 15 year-old Anthony Borges was shot five times by Cruz as Borges slammed the door shut, protecting 20 of his fellow classmates inside his classroom at Marjory Stoneman. Roger Borges, Anthony’s father, read the email exchange between Duncan and Emanuel regarding the Sandy Hook Elementary School shooting. In response, Mr. Borges released a statement through his attorney to The Baltimore Post. “It is clear by the email and comments in the press that he is prepared to sacrifice children’s education to pass a gun bill. They care more about passing gun legislation than keeping the schools safe,” he said. Yet, the public is split on where to place the blame. While some accuse Broward County schools for the attack by allowing Cruz to slip through the cracks under Duncan’s ReThink Discipline policy, others place the blame squarely on insufficient gun laws. On the one hand, critics of the school system say that Cruz was able to obtain the firearm because he was not helped nor disciplined sufficiently as a student which would have established a criminal record preventing the firearm purchase in first place. On the other hand, some see that regardless of Cruz’ long history of deviant behavior, the former student – who returned to his former high school to massacre students and teachers – was able to purchase the assault refile because there is no ban against them. After the shooting, Duncan took to Twitter to share his thoughts on where he thought the focus should be. “My plea: Please, no more ‘thoughts and prayers’ from politicians. Sorry, that is beyond insufficient. We need legislation- laws passed- that protect children, and all of us, from gun violence…” Duncan said. But another school tragedy would strike again three months after Parkland’s, in the form of yet another mass school shooting in Santa Fe, Texas. Last week, while using a shotgun and a .38 caliber revolver, 17 year-old Demitrios Pagourtzis took the lives of eight students and two teachers, while injuring 13 others. In response to that shooting, Duncan released a statement – again on Twitter – this time calling for kids and parents to boycott school, altogether. “What if no children went to school until gun laws changed to keep them safe?” Duncan continued. But in opposition to the federal guidelines he created as education secretary to keep all kids in school, Duncan doubled-down in an interview on CNN yesterday morning, advocating for them to stay out. “It is absolutely a radical idea. It is provocative,” Duncan said. Duncan then mentioned November’s election as a way to hold resistant lawmakers accountable for any lack of action. After the Parkland shootings in February, nationwide school “walk-outs” and organized marches in protest of school shootings mobilized across the country. American students, staff and parents protested current gun laws which they say allowed for such tragedies like that in Parkland to occur. But some advocates see Duncan’s message to boycott schools as being less about school safety, and more about politics and political expediency, leading up to the elections. Because if Duncan, they say, were truly concerned about school safety, the federal guidance he instituted that has led to an increase in school violence wouldn’t, itself, be harming America’s schools. One such advocacy group sees the irony. The Baltimore-based non-profit group, “Parent2Parent Network,” which focuses school climate and safety and fields daily complaints related specifically to school violence as a direct result of Duncan’s Rethink Discipline guidance, aims to empower school communities in order to restore school safety. 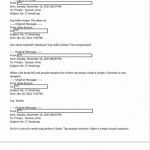 The Duncan/Rahm emails, which elucidate the politics behind a tragedy as it was unfolding, were obtained by The Baltimore Post after a reporter – who was researching another matter – filed a Freedom of Information Act request last summer with the U.S. Department of Education. 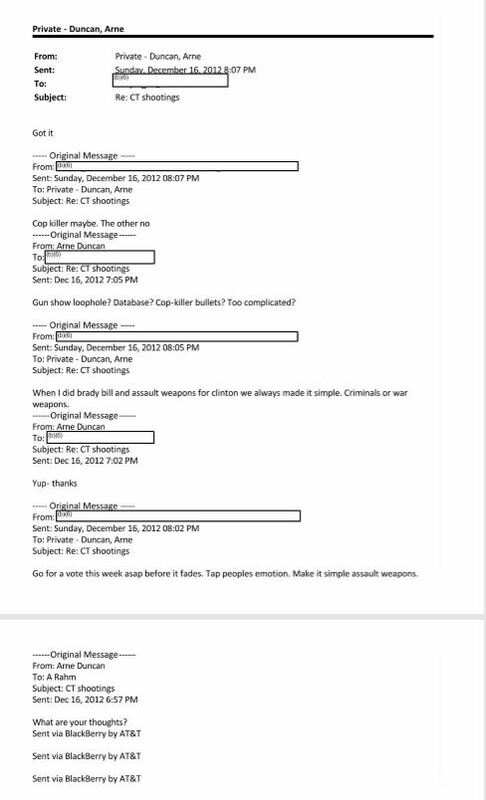 When confronted with the emails about how to handle the Sandy Hook shootings, neither Mr. Duncan, Mayor Emanuel nor their office staff chose to respond. He said he hopes a nationwide boycott of schools, accomplished through mobilizing students, will compel lawmakers to make a change. Emails can be viewed here. Will Baltimore County Schools fail to meet its financial obligation to Hewlett-Packard?